Hi guys, and welcome to a new Top Ten Tuesday! If last week was all about looking ahead to the shiny new books we are anticipating, today it’s time to get those feet back on the ground and think about all the books from 2016 we STILL haven’t read. Now, I have a huge backlist. It’s one of my goals to get more older releases read, instead of getting distracted by the sparkle of new books (buuuut, they’re so shiny and I NEED THEM too!). Ahem. We’ll see how well I do this year. Here is a selection of ten 2016 releases I STILL need to read. And I will. I promise. Just as soon as…. oh hey a new shiny book! I was sooo looking forward to reading this fantasy revenge plot and then… I never did. But it’s okay, with the sequel on it’s way, maybe I can binge read them both this year! Aladdin is one of my favorite Disney stories, so the fact that I haven’t read this retelling yet fills me with sadness. BUT it’s on my shelf already, so I’m sure I’ll get to it soon! 2016 was the year I fell in love with Marissa Meyer’s Lunar Chronicles. So of course I want to read her Queen of Hearts retelling. It has pastries! I need it! This wasn’t originally on my TBR to be honest, but I’ve heard so many raving reviews that I am super intrigued. I’ll get to it in 2017! Another series set in the world of the Seven Realms? YES PLEASE! I haven’t read it yet, but again, I’m okay with that because it means I’ll be able to binge read the sequel, Shadowcaster, immediately after. 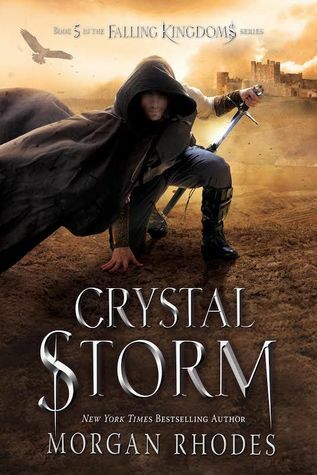 I was highly anticipating this fantasy, but some mixed reviews have thrown me off a bit and caused me to procrastinate. I still definitely want to read this though! I just may wait until the sequel comes out. OK, I’m sure you guys are probably tired of me saying I need to read this sequel to The Wrath and The Dawn. But seriously, I need to read this. Actually, I’m reading this right now, so GO ME! Well, this only came out in December, so technically I’m not that far behind… But still, it’s one of my favorite series and has my favorite character on the cover. I NEED to read this soon. Another release I was so looking forward to and for some reason just haven’t picked up yet. I’m new to steampunk, but this just sounds too good to pass up on. Clock spirits? YAS! 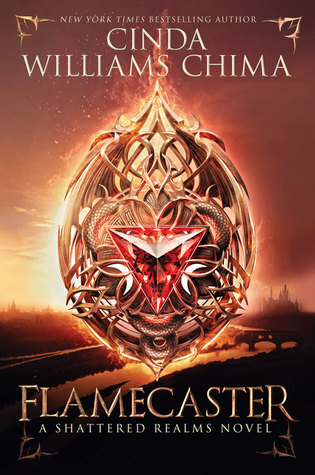 You may know about my desire to catch up on all Rick Riordan’s books and this one is definitely one I want to read soon. Just, you know… after I re-read the entire Percy Jackson and the Olympians series AND caught up with the entire Heroes of Olympus series. It’s one of my main goals for 2017! Have you already read any of these? Which would you push me to read first? Do you also easily get distracted by shiny new books? Any we both still have to read? 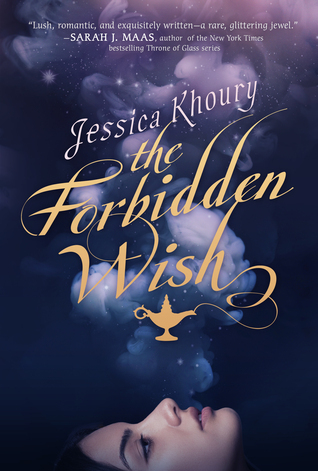 I’ve got The Forbidden Wish on my TTT list too, and I would’ve included Stalking Jack the Ripper if I hadn’t decided to focus on only fantasy reads to narrow down my top 10. 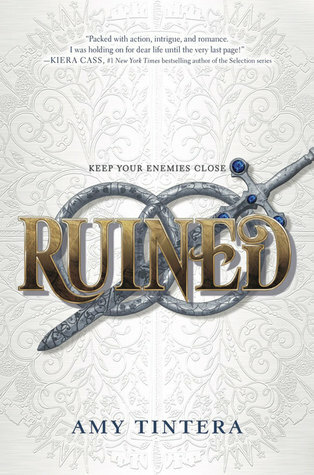 Am now going to add Ruined to my list too! Three Dark Crowns *nods* I started it in the bookstore lol and was sucked in, now I need to finish! 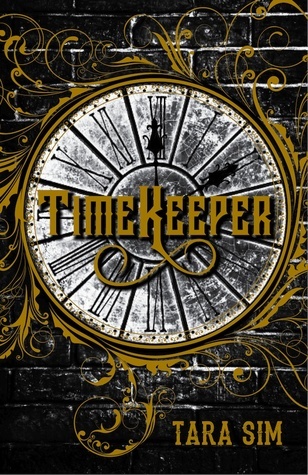 Timekeeper looks fun, and I love the cover of Ruined. Hope we’ll both get to Three Dark Crowns soon 🙂 And yes, the cover for Ruined is so beautiful, I love it too! Thanks! 🙂 Hope we’ll both get to Stalking Jack The Ripper and Three Dark Crowns soon! Heartless was so much better than I was hoping for!! I was worried that it wouldn’t be as good as TLC, but it was just different– not better or worse. I totally recommend trying Stalking Jack the Ripper. It was cool reading about a girl trying to be a coroner in that time period! 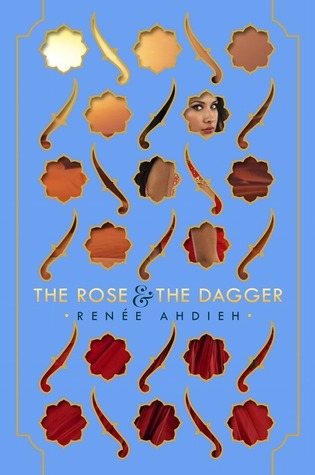 You definitely need to read The Rose and the Dagger! It was a lovely conclusion. I was hoping to fit in Heartless in December and it didn’t happen. Maybe soon! I get distracted by shiny new books too. It’s a problem. Oh yes, I actually just finished The Rose and the Dagger so maybe my post was a little badly timed 😉 But it was indeed so good <3 Glad I'm not the only one distracted by shiny books! There should be a law that doesn’t allow a reader to see all the wonderful books she missed. It’s so frustrating! I still need to get to the Rose and the Dagger which I have had since it came out. Whoops!! Also Heartless is one I want to read because I LOVED TLC. Hope you get to all of these!! I actually just finished The Rose and the Dagger, so at least that is one book down now 🙂 But it was really good, hope you’ll get to it and Heartless soon! I would definitely recommend Three Dark Crowns – it started off slow, but the ending was crazy – and the sequel is coming out this year! I also enjoyed The Rose and The Dagger – great world-building! Most of these are on my TBR as well. Stalking Jack the Ripper is excellent and I’m excited because it supposed to be a series and Heartless was really good as well. Ruined and Timekeeper are both on my TBR too 🙂 I really enjoyed The Forbidden Wish, I hope you get around to it soon. Three Dark Crowns is on my list too. It sounds so great! It does! Hope we’ll both be able to get to it soon! Three Dark Crowns made my list, too! It went on Kindle sale over the holidays so I scooped it up and I’m really looking forward to reading it! I’ve heard mixed reviews, too, but it seems like my sort of thing, so we’ll see if I’m actually any good at predicting my own taste, eh? Oh, I actually just finished The Rose and the Dagger yesterday (Yay, at least one book crossed off from the list 😉 ) and you are right, it was AMAZING! I was afraid it’s been too long since I read The Wrath and the Dawn, but I was sucked right back into the story <3 The writing is just so beautiful! Haha yes, just 10 books? That’s nothing compared to the actual massive size of the TBR 😉 Glad you loved Heartless, hope I’ll enjoy it too! I’m excited but a little nervous to read Heartless. I have high hopes! I hope you enjoy these books when you get around to them. I totally understan, my hopes are high too 🙂 Hope it’ll live up to both our expectations! I haven’t read any of these either so ? but I feel the same way about Three Dark Crowns, the reviews didn’t help at all. Haha, glad I’m not the only one 😉 Yes, the reviews for Three Dark Crowns have bummed me out a bit, but I’m still hoping to enjoy it. It’s totally crazy how many good books are coming our way in 2017! Well, a good kind of crazy anyway 🙂 Hope they’ll all live up to our expectations! I haven’t read any of these titles yet either even though I’m dying to do so. If only I could just get paid to sit and read all day, I’d knock them all out in no time, haha. Hope you get all of these read this year! Haha, I completely understand, that would be my dream job too 😉 Hope you’ll have a great reading year though! I hope you enjoy Heartless, Timekeeper and The Hidden Oracle, they’re all great! Heartless made my list and I have it in 3 formats- the eArc, the paperback arc and now on audio… I will get to it because it is literally haunting me. I checked out Stalking Jack the Ripper recently, now let’s see if I can get to it before my renewals run out! I hope the time to read all the books you want to read comes through this year! I need to read a few of these myself. I am particularly excited for Three Dark Crowns and The Forbidden Wish. Ahhh I meant to read almost all of these too!!! And….didn’t lol. THERE ARE JUST SO MANY SHINY BOOKS TO READ!! Timekeeper looks amazing. I adore Steampunk. Have you read Gail Carriger??? Her books are HILARIOUS and full of fun plot twists! I did not know about Gail Carriger but I’ll go check her out right away! GAHHH I get SO distracted by shiny new books! Like it doesn’t even matter how much I was DYING to read a book, when a newer, shinier one shows up… all bets are off! Also this list made me remember a whole gaggle of books I meant to read and have not. Like Timekeeper, Heartless, SJTR, Ruined…. gah. 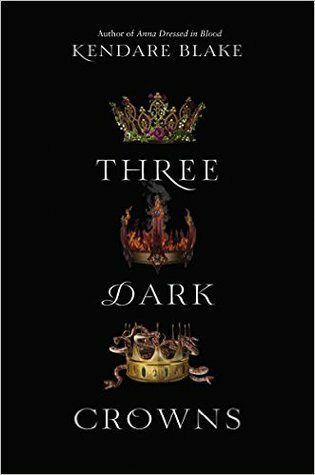 I personally LOVED Three Dark Crowns, so that one would be a must read for me, BUT I have read mixed reviews too, so I get your apprehension. I liked The Rose and the Dagger- not *quite* as much as Wrath, but still a very good book. And The Forbidden Wish was good too! Good luck, I hope you get to these soon! Omg SO MANY GOOD BOOKS HERE. *flails* I absolutely adored Timekeeper and Ruined and Trials of Apollo!! And I’m completely guilty for not having read Three Dark Crowns yet, even though it was super highly anticipated for me last year?!? Like how are we supposed to keep up with all these glorious releases.? I hope you have better luck with Flamecaster though! It actually ruined the Demon King series for me and I was so so devastated haha.? I won’t say anything else though because I don’t want to be annoying but just GOOD LUCK. And omg I so need to read Stalking Jack the Ripper too! I’ve only heard amazing things about it! 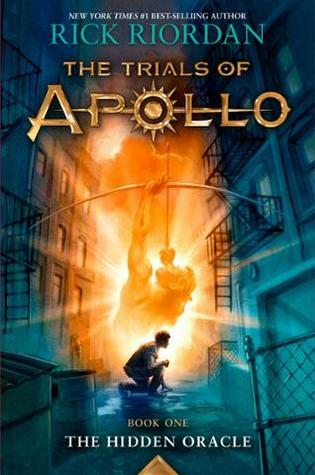 The Trials of Apollo was one of my absolute faves from last year!! I loved it so much!! 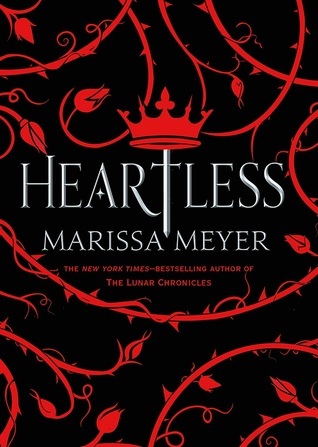 I had mixed feelings about Heartless and Three Dark Crowns, but I hope you enjoy them!! 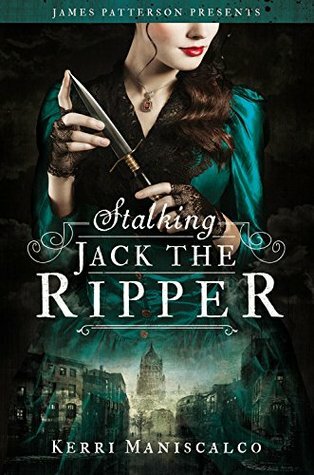 I really want to read Stalking Jack the Ripper! I’ve read a lot of mixed reviews about both Heartless and Three Dark Crowns so it’s making me procrastinate a bit, but I still hope I’ll enjoy them. Oh, and Stalking Jack The Ripper sounds so good! 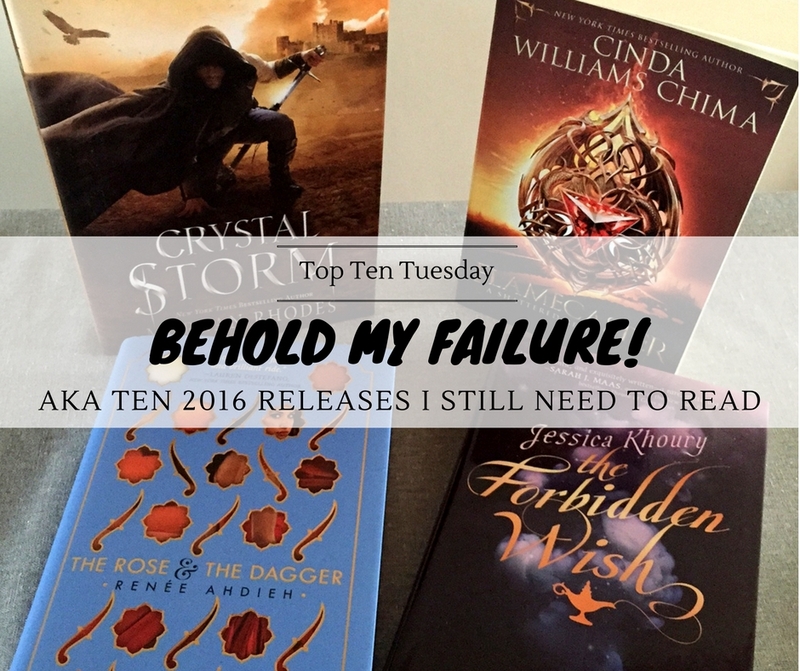 A few off my own failure list I see 😉 It looks like either I’ve read these books or they are on my own TBR. I loved Heartless and Three Dark Crowns. I really, really need to start the Falling Kingdoms series (how does that one keep slipping past me?). I’m about to pick up the Hidden Oracle this week too! Hopefully we’ll both get to hit the TBR hard this year! Ah I’m happy you enjoyed both Heartless and Three Dark Crowns! I’ve read some mixed reviews, so that’s why I keep on procrastinating… But I still hope I’ll really enjoy them! Hope we’ll both beat our backlist this year!